There has been bitter political history between the Gowda family and Siddaramaiah, who left the JD(S) to join the Congress, so the symbolism was not missed. HD Deve Gowda, chief minister, HD Kumaraswamy of the Janata Dal Secular arrived at the press meet venue. All is well with the ruling coalition in Karnataka. That was clearly the message that the Congress and Janata Dal Secular wanted to send out at a crowded press conference on Tuesday. The media meet was delayed by one and a half hours as leaders from both parties discussed elements that had seemed to threaten that unity. 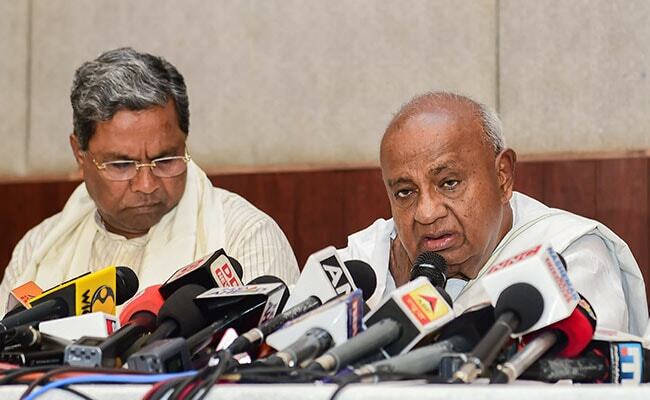 But finally, former prime minister HD Deve Gowda, chief minister, HD Kumaraswamy of the Janata Dal Secular arrived at the press meet venue and took their seats on either side of former chief minister, Siddaramaiah, of the Congress. There have certainly been hiccups in the process of dividing tickets for the state's 28 Lok Sabha seats; and even after it was decided and announced that the Congress would keep 20 seats and the JD(S) would contest eight -- there have been further negotiations about the seats allotted. Tumakuru, where a sitting Congress MP, Muddahanumegowda, had to make way for the JD(S) was a case in point. Deputy Chief Minister G Parameshwara, who is a lawmaker from Tumakuru district, is reportedly unhappy over the seat being given to the JD(S). Mr Parameshwara had skipped the press meet. HD Devegowda told NDTV: "As an elderly person, it is my responsibility to carry both parties. I had taken the decision after KC Venugopal met me at my residence. I have discussed with Siddaramaiah, one to one. We should move together to give a tough fight. That is why I gave this message when I met Rahul Gandhi in Delhi". The BJP strength, he said, must come down in Karnataka under Kumaraswamy and Siddaramaiah. "Siddaramaiah and I have taken a firm decision to move to all the 28 seats, speak together. If we come together, then the result will have a major change," Mr Devegowda said. Chief Minister Kumaraswamy told NDTV: "Everything is fine, everything is under control. We will fight together... 100% we will sweep all the seats in the state with the help of our voters". It is still not clear which seat Mr Devegowda will contest from. He has given his seat of Hassan to his grandson Prajwal. And he dropped a hint that he may not contest at all. He said, "I don't know who is curious. Whether my need is there in Parliament or not. I have not yet taken a decision." The Congress's chief in Karnataka, Dinesh Gundu Rao, told NDTV, "When we had the by-election also we sat and discussed the whole strategy. Last night also we had long discussions and Mr Deve Gowda's house. We had a free, fair, frank discussion. We will go with one voice and we want to get the best result possible." Mr Gundu Rao said it was unlikely that the seats allotted to each party would change. Mr Devegowda had asked for the Congress's opinion as to which seat he should contest, but that it was up to the former prime minister to decide, he added. The old Mysuru region was comfortable for the coalition. "I think the entire old Mysuru belt, wherever JD(S) and the Congress are contesting, I think we should win all the seats, except for Bangalore, where we need to fight it out. Kolar, Chikballapur, Tumakuru, Mandya, Hassan, Mysuru, Chamarajnagar - all these seats we are 100% going to win," he said. A massive joint rally is planned at the end of the month in the state. Mr Devegowda said, "We took a decision to have the biggest rally in Karnataka on the 31st of March to be addressed by Rahul Gandhi to give a message to the whole country how the coalition government can put aside all difference to come together to fight the fundamentalist forces." "We have also conveyed the message to Rahul Gandhi-ji. 5-lakh plus, massive rally. The message should not only go in Karnataka but across the country. That is the idea," added Dinesh Gundu Rao.